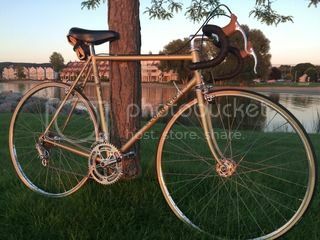 I came across this vintage Colnago and would like some help identifying the year and model. It has all campy parts except for the brake levers and pedals. the frame is in pretty good condition with no nicks or dents, but the paint has come off in some small areas where the metal is exposed. The decals look pretty badly done and dont seem original. The bike rides much better than she shows. What would be a good price on the market to sell / buy it? I'd say 1975 or 76 based on short dropouts, fork crown engraving and lack of TT cable guides. Hard to say about the model. Has the frame been repainted? I doubt it was a total repaint just by looking at the BB shot showing the club cutout where the rust is rather aged. Looks original there Definately mid-70s at the latest. Decals on the forks are strange but then so is the red coloring. Decals are replacements and looks like the wrong choice? Anyways, nice bike! My guess is you have a Super. If so, you need decals with black letters trimmed in yellow. Does this underneath pic look similar? Ok, I just checked www.cyclomondo for red lettered decal kits and Greg Softely has one listed for mid-70s Colnago's. I still think it's a Super. Here is my later model '77 with a replacement decal kit I applied last July. I hope the bike fits you well because you have a beauty and there arent too many of these classic racers around anymore. Keep it if you can. Also, I read the Mexicos were lighter than the Supers because of the tubing. This one doesnt feel particularly light even taking the brooks saddle and shimano pedals into account. @OldsCOOL...it is a beauty, your restoration. Do you have a blog or write up on how you did it? I would love to check it out. Any suggestions on price? I'd love to know i wasn't suckered. Not sure what your Colnago is worth but can say condition, area market and bike componentry are factors. I paid 800$ for mine just because these are hard to find so the "bird in hand" adage aptly applied to me. Last edited by OldsCOOL; 11-15-15 at 11:36 AM. I did study the pics but couldn't give a definitive year. Pre- '76. Different looking graphics and then the BB shell cutout seem odd. Regardless, could be a gem rider once again. There's another section for appraisals. Last edited by crank_addict; 11-15-15 at 11:39 AM. I concur with '75 or '76. Not much later as by '77/'78 the top tube cable guides were brazed on and Colnago engravings began appearing on the seatstay caps. I'd bet your paint is original, but the decals are not. Well, the remnants of the World Championship half-band on the seat tube is original, but all the rest? Nah. 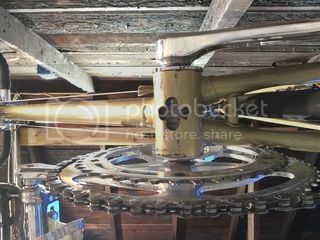 Are there any threaded drillings (parallel to the axle) in the driveside rear dropout? And do the fork stiffening tangs have small clover cut outs? Nice candidate for a correct reproduction or original decal set and a good cleaning. Don't re-do the paint - it's not too bad and you can see how well OldSchool's paint came back to life in his thread.